The men managed to get the goat on board the SS Lapland and overseas to England, where they arrived in October 1914. They managed to keep him from being quarantined when they arrived and moved to Lark Hill Camp. 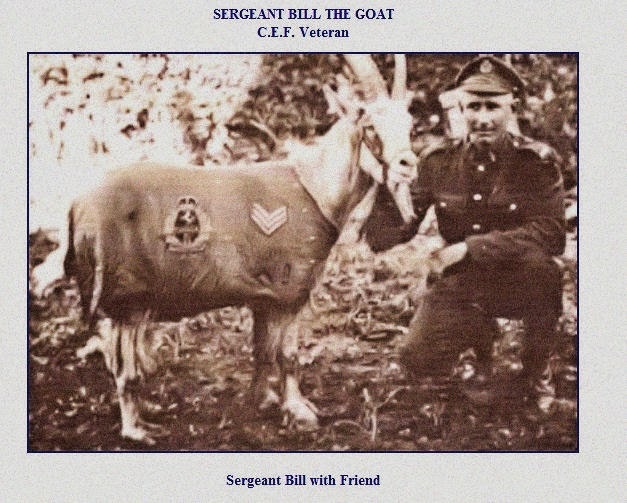 Billy was smuggled to France in February 1915 by his "boys", who refused to leave him behind as ordered. Soon after he arrived at the front, Billy was caught nosing around the orderly room. The battalion roll was found to be missing and Billy was placed under arrest for theft when chewed remnants of the roll were found in his billet. A second arrest within a month for charging on a superior officer put Billy into disfavor. However, all was forgiven when he distinguished himself in later battles. At Neuve Chapelle in February 1915 Billy was given the rank of sergeant. Later at Ypres, he was once found in a shell crater standing guard over a Prussian guardsman, in spite of the fact that he was bleeding from a shrapnel wound. Billy was also gassed during the Second Battle of Ypres and afterward disappeared. The men much feared that he had fallen into the hands of the Bengal Lancers from India, who were reputed to have a taste for goat curry. However, he was found, safe and sound. He got trench foot at Hill 63 in December 1915 and was shell-shocked at Hill 70 in April 1917 during the battle for Vimy Ridge, problems also suffered by many of his human comrades. He was wounded twice by shrapnel at Festubert. He is also credited with saving three people's lives, getting more shrapnel wounds in his neck in the process, for which he received the Mons Star. During a time of shelling, Sergeant Billy, possibly forewarned by his superior hearing, once butted a sergeant and two others into a mud-filled trench just before a shell exploded where they had been standing. Bill also received the General Service Medal and the Victory Medal. When the Fighting Fifth got home to western Canada, Sergeant Bill led the parade. When he died, Bill was stuffed, mounted, and placed in the Saskatchewan Legislative Building. Eventually he was returned to Broadview, where he now has a place of honor in the Broadview Museum. We have the book about this awesome goat. Where Do Failed Generals Go?